Our high-quality XL Motor Activity Cube made of FSC® 100%-certified wood from the „Move it!“ product group impresses customers on all sides with its high playtime value because there’s so much to explore: rotatable wooden tiles in the style of the game Memory train children’s memories, a searching game with a hedgehog, a ladybeetle and a bird provide lots of fun, and a seasons calendar imparts knowledge about spring, summer, fall and winter. The wheels game with gears and a labyrinth completes this motor activity world. 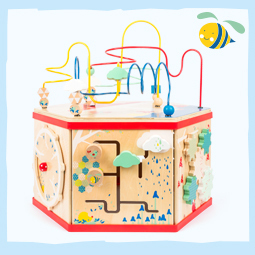 A large motor activity loop on the removable lid is the crown on top of all the fun. And here’s something special: this motor activity cube also makes a great impression as a stool or table! The Motor Activity Cube is one of the toys that you can find in the Move it! product series. In the motor activity toy category, we’ve thought of a selection of coordinated products which fit together not only fun-wise, but also colour-wise as a sort of collection of toys. We’ve been using this approach since 2014, and have been gradually applying it to all areas of our large assortment. As a result, there are now different play worlds and toy lines in which playtime value, the spirit of playing and design are united in one coherent overall concept. Lisa designed our largest product, the XXL Motor Activity Cube, and she also designed the faces of the six main characters on it. Lisa: „My wish was to illustrate the animals‘ essence in their faces and to breathe life into them. This is how the small, chubby squirrel became a food lover, the bumblebee become a nimble blossom collector, the little sparrow becomes a cheeky berry hoarder and the hedgehog – hey, where is the hedgehog, anyway? – becomes the best hide-and-seek player. The current colours and characters of the Move it! series were the foundation of my design which would be enhanced with new elements such as branches, mushrooms and a modern triangle pattern. Are you getting curious, too? Then come visit the Move it! XL Motor Activity Cube in our online shop and get this new favourite in the children’s room for your own assortment!